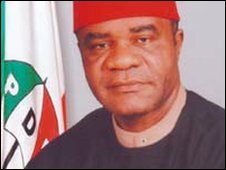 The chairman of Nigeria's governing People's Democratic Party (PDP), Vincent Ogbulafor, has resigned days after facing fraud charges in court. Mr Ogbulafor is accused of fraudulently receiving $1.5m (£1m) in federal funds when he was a government minister under ex-President Olusegun Obasanjo. He denies the charges but was under pressure to step down. Mr Ogbulafor's problems are seen as part of the PDP leadership struggle prior to the 2011 presidential polls. The BBC's Caroline Duffield in Abuja says many Nigerians will assume his fall has more to do with internal politics than the fraud charges, which - for Nigeria - represent a fairly small amount of money. President Goodluck Jonathan is thought to be interested in running for elections next year. But if he is to do so, his own party's rulebook - and senior officials - stand in his way, our correspondent says. The PDP has a system of rotating its candidate for president between people from the north and the south of the country. President Jonathan is a southerner and the PDP has said its candidate for the 2011 elections will be from the north. Our correspondent says most Nigerians do not much care whether the leader is from the north or the south. She says they want fair elections, running water and stable electricity.